Visual Interfaces for Mobiles @ NCSU: Find: rim will put its tablet os on "superphones". What's next? Superduperphones? Puhleez! Find: rim will put its tablet os on "superphones". What's next? Superduperphones? Puhleez! Research in Motion just kicked out its year-end and Q4 earnings for fiscal 2011, and while things look fairly rosy for now, shares of the company have sunk around ten percent in after-hours trading. Why? Because even the greatest performance in the world can't ward off skeptical investors who are keyed in on guidance. The outfit reported expected revenues of around $5.2 billion and $5.6 billion, with earnings ranging from $1.47 billion to $1.55 per share. Sounds lovely, but not when you consider that analysts had expected those figures to be closer to $1.65 per share. 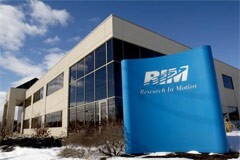 That said, RIM did manage to ship 52.3 million BlackBerry smartphones, representing a 43 percent uptick over fiscal 2010. Furthermore, fiscal 2011 revenue shot up 33 percent over fiscal 2010 (landing at $19.9 billion), and we were given a confirmed ship date of April 19th for PlayBook. If you're looking for a breakdown in revenue for the quarter, you'll be interested in knowing that 81 percent was attributed to devices, 16 percent to service and just three percent to "software and other revenue." Based on what we've gathered from the earnings call, RIM understands that it'll be selling more lower-end devices going forward (during what it continually referred to as "a transitional period"), and it's expecting stronger revenue to come from software and services based around QNX. In fact, QNX (known as BlackBerry Table OS on the PlayBook) was pinpointed as being an OS for future "superphones," and while we heard a brief mention of the impending BlackBerry OS 6.1 release, it's fairly evident which platform the outfit is salivating over. If all goes well, we're told to expect some sort of RIM superphone in 2012, and while our instincts are telling us that just has to refer to a phone with a 4.3-inch display, no specifics whatsoever were given beyond the moniker.